Implementing a fleet telematics solution can improve operational efficiency as well as provide data for strategic decisions, such as right-sizing your fleet. For service fleets, the information can assist in planning daily routes. For construction mixed fleets, the data makes your equipment and vehicles visible to the team. There are many benefits, such as these, when this technology is utilized at your organization. TheYet, sometimes the biggest hurdle to overcome is selling the idea of why vehicle and asset telematics is worth the investment. Some of the reasons you might encounter are “we’ve always done it this way” or “it will take too long to train the crew on the technology.” Below is some background on the use of telematics that you can use to support your case. For your fleet, the value comes from full access to utilization records in real-time that you can use to improve productivity of your assets and team. Telematics helps you spot inefficient processes and asset deployment. As you address these issues, you can become more competitive through better job costing and, customer service. The GPS devices tap into the CAN bus of your equipment and vehicles to access important information such as engine hours or odometer readings, fuel levels or service indicators. The data is accessed through software to give insight into real utilization and health metrics of your fleet. Let’s review a few of the more common data points used to remotely optimize operations, improve safety and streamline processes. 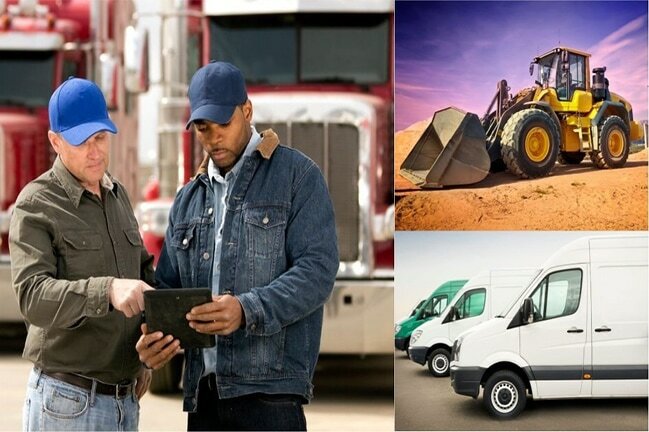 •	Locating vehicles or equipment on demand: Save time from having to call around or even physically visit different job sites to find your fleet or collect utilization information. It allows you to re-allocate assets, owned or rented, as job needs change. •	Managing idle time: Put your assets to work by allocating your fleet to where it’s needed. Plus, the data can help you manage fuel expenses. Or, for service fleets, it might mean that you check in with your staff to make sure everything is okay. •	Scheduling maintenance: Be proactive with keeping your vehicles and equipment in top shape to reduce untimely breakdowns. Pull your assets into the shop when regular tune-ups are required or address issues immediately when you receive an alert. •	Understanding activity: Get alerted by triggered events for movement, unauthorized use, equipment that is out of defined areas or even potential maintenance issues. Now, you are armed with a good background to help overcome some of the initial resistance. With this information, you can state your case for implementing it with your fleet. Solutions such as FleetOutlook™ and AssetOutlook™ also have the benefit of seamless integration with legacy and back end systems in order to exchange the vital information needed for your operations. Want to continue the conversation? Send us a message or call us at (703) 262-4040!